Background: Lifestyle changes and medication adherence are often recommended to patients after acute coronary syndrome (ACS) as secondary prevention strategies. However, the impact of cognitive impairment (CI) on these secondary prevention strategies following ACS has not been examined. 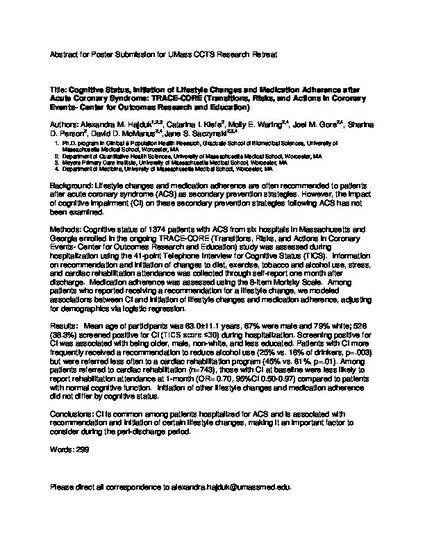 Methods: Cognitive status of 1374 patients with ACS from six hospitals in Massachusetts and Georgia enrolled in the ongoing TRACE-CORE (Transitions, Risks, and Actions in Coronary Events- Center for Outcomes Research and Education) study was assessed during hospitalization using the 41-point Telephone Interview for Cognitive Status (TICS). Information on recommendation and initiation of changes to diet, exercise, tobacco and alcohol use, stress, and cardiac rehabilitation attendance was collected through self-report one month after discharge. Medication adherence was assessed using the 8-item Morisky Scale. Among patients who reported receiving a recommendation for a lifestyle change, we modeled associations between CI and initiation of lifestyle changes and medication adherence, adjusting for demographics via logistic regression. Results: Mean age of participants was 63.0±11.1 years, 67% were male and 79% white; 526 (38.3%) screened positive for CI (TICS score ≤30) during hospitalization. Screening positive for CI was associated with being older, male, non-white, and less educated. Patients with CI more frequently received a recommendation to reduce alcohol use (25% vs. 16% of drinkers, p=.003) but were referred less often to a cardiac rehabilitation program (45% vs. 61%, p=.01). Among patients referred to cardiac rehabilitation (n=743), those with CI at baseline were less likely to report rehabilitation attendance at 1-month (OR= 0.70, 95%CI 0.50-0.97) compared to patients with normal cognitive function. Initiation of other lifestyle changes and medication adherence did not differ by cognitive status. Conclusions: CI is common among patients hospitalized for ACS and is associated with recommendation and initiation of certain lifestyle changes, making it an important factor to consider during the peri-discharge period.